FORT LAUDERDALE – In the middle of a difficult economy, with resources at a premium and enough challenges to occupy church leaders everywhere, one congregation in the South East Florida District has its focus firmly fixed on overseas mission. The congregation, Korean UMC of South Florida, may be located in Fort Lauderdale but its members' hearts are in Haiti. “Even before the earthquake, our church had a connection,” said Pastor Chris Baik, noting that a few members began visiting Haiti in 2003, years before a massive earthquake rocked the nation's capital, Port-au-Prince, in early 2010. Baik, who came to the church as youth pastor in 2005 and now leads the English-speaking population there, was among those already familiar with Haiti. Korean UMC of South Florida is responding to needs of people like these in Haiti, long an impoverished nation and recently devastated by natural disasters. UMCOR photo. “When I first came, within two weeks I had my first trip to Haiti,” he said. Just a few months before the earthquake hit, Korean UMC made a commitment to build and support a permanent mission center in Cité Soleil, the poorest and most desperate quarter of Port-au-Prince. “We had the outer walls and the foundation built the day the earthquake hit,” Baik said. The quake registered 7.0 in magnitude and devastated the area around Port-au-Prince. The Red Cross estimates 3 million were affected, and the Haitian government reported more than 316,000 dead. What had started earlier as a small outreach quickly blossomed into a massive church-wide effort. “Our church embraced it,” Baik said. 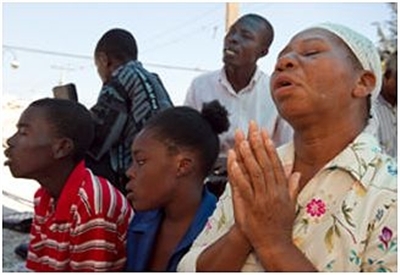 Since the disaster, Haiti has been the overseas priority for the congregation. Members completed construction of the mission center, the school is running, the medical facility is almost competed, and a full-time lay missionary, Simon Kim, is on site. The school trains Haitians in vocational skills, including sewing, crafts and a fully operational bakery. Missionary Kim leads a 50-member pastors’ association from the mission in Cité Soleil, and the work supports seven orphanages and several local churches. Additionally, a regular wedding class is taught for Haitian couples, a commitment that includes marriage counseling, ceremonial wedding attire, and a first-class ceremony where their new way of life is celebrated. South East District Superintendant Craig Nelson, who has traveled to Haiti with the Korean mission, said the congregation’s enthusiasm and commitment is inspirational. Baik reported, and Nelson confirmed, that the Korean church has spent literally hundreds of thousands of dollars in Haiti while facing mounting challenges to provide adequate worship and educational space at home. “We don’t have any classrooms here,” Baik said. “And no fellowship hall. Our senior pastor doesn’t even have his own office. We have fellowship outside under the tent. It’s pretty hot in the summer. 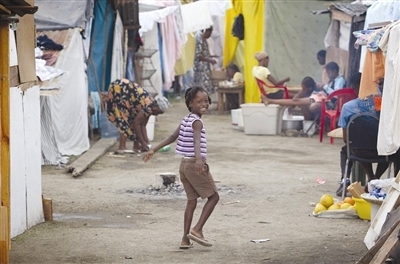 But we’re OK.
A child runs through a marketplace set up in Port-au-Prince. UMNS photo by Mike Dubose. Baik said he believes the ongoing mission helps the overall spiritual life of his congregation. A team travels to Port-au-Prince at least every other month, and Pastor Baik has been at least 30 times. The Florida Conference also sponsors mission work in Haiti through its covenant relationship with The Methodist Church of Haiti. For information, visit www.haitifloridacovenant.com or contact Dionne Hammond at dhammond@fumc-melb.org or Icel Rodriguez at irodriguez@flumc.org. To find out more about the Korean UMC of South Florida's mission, call Pastor Baik at (954) 739-8581. * Derek Maul is a freelance writer based in the Brandon, Fla., area.